The ion-exchange resins have been applied for some time in the food field but also in other sectors such as pharmaceuticals, metallurgy, etc. Their use in wines has not yet been approved, but is a technique that has developed and is being used for the production of concentreted rectified must, and therefore on musts. Agrovin, in collaboration with several research centers, including the University of Castilla la Mancha, has been carrying out research on the possible applications of anionic resins in the enological field for some time now. Professor. 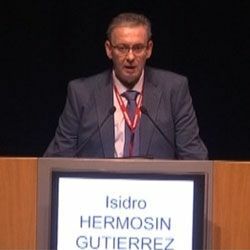 Hermosin Gutierrez, in the first part of his presentation at Enoforum 2017, offers a detailed overview of the different types of materials that can be used for this purpose, the theoretical and practical aspects concerning the properties they must have and the different types of resins present on the market. In the second part, he analyzes the legislative aspects related to their application in the food and oenological fields, then he presents some application cases in the treatment of oxidized white wines and illustrates the possible future applications in the oenological sector such as pesticide elimination, protein stabilization, decrease of the SO2 content and the elimination of unwanted compounds.